This week, we’re continuing to munch our way through intriguing recipes in The Best of Ukrainian Cuisine. It’s been hot lately, though not as hot as usual (thankfully), with temperatures here around 97F/36C. There’s still August to not look forward to when afternoon temperatures rise to 102F/39C and above. I expect we’ll be trying out more cool soups, such as chilled avocado and cucumber soups that I’ve been thinking about making. 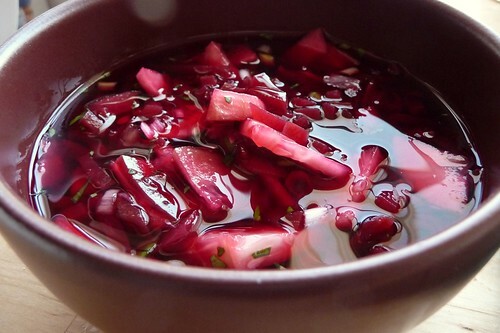 For now, we’ll start with a cool, refreshing borsch that’s super-easy to throw together and tasty too. I really enjoyed this chunky borsch but kept thinking it would be even better if it were pureed into a creamy, thick soup instead. Since there were plenty of leftovers, I gave it a whirl the next day for lunch. The verdict? Even better! I think I prefer it this way, with a dollop of sour cream on top. Combine all ingredients except buttermilk or kefir in a large bowl. Refrigerate until ready to serve. Add buttermilk or kefir just before serving, stirring well to incorporate. Adjust the seasonings and amount of water to taste. (Any kind of cooked beets works here, whole or chopped.) Prepare as above but only use 2 cups of water. Puree in food processor or blender (or use an immersion blender). When ready to serve, stir in kefir or buttermilk. If the soup is too thick, thin it out with water. This entry was posted in gluten-free, soup, ukrainian, untranslated, vegetable, vegetarian. Bookmark the permalink.